With this lesson, Nervous System for Kids, you’re going to learn a great deal of facts related to your nervous system. The nervous system is made up of nerves, the brain and the spinal cord and it transports messages between the body and the brain. Your nervous system does thousands of different things all at the same time, making itself the most complex system in your body. It is the main system that is specialized for the control and coordination of all body parts. Learn many more about the human nervous system with this interesting lesson, human nervous system for Kids. What is the nervous system made up of? Each and every part of your body contains nerve cells. 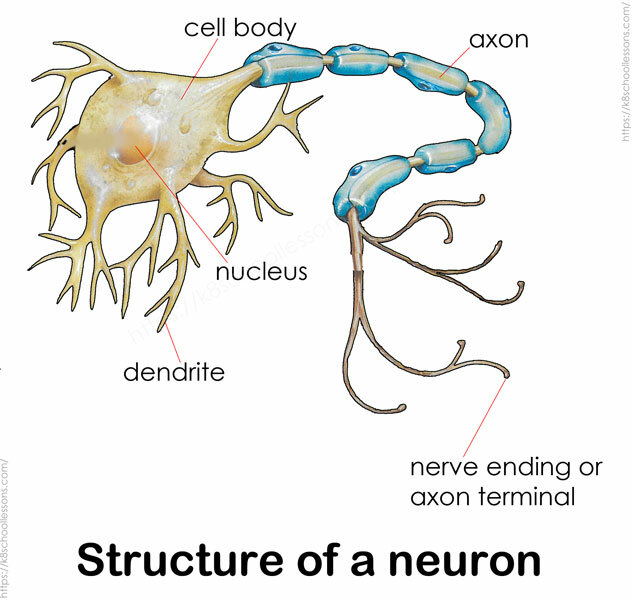 Nerve cells are also called neurons. These neurons lie next to one another forming long chains to make the network of nerves. We call this network, along with the brain and the spinal cord, the nervous system. Your nervous system senses the world around you and sends instructions to every part of your body to keep it working. It transports messages between the body and the brain. How does the nervous system transport messages to and from the brain? Just like the runners of a speedy relay race passing the baton onto the next runner, the nerve cells in your nervous system pass messages to their neighbouring cells to and from the brain. This is easy because of the special structures called synapses. 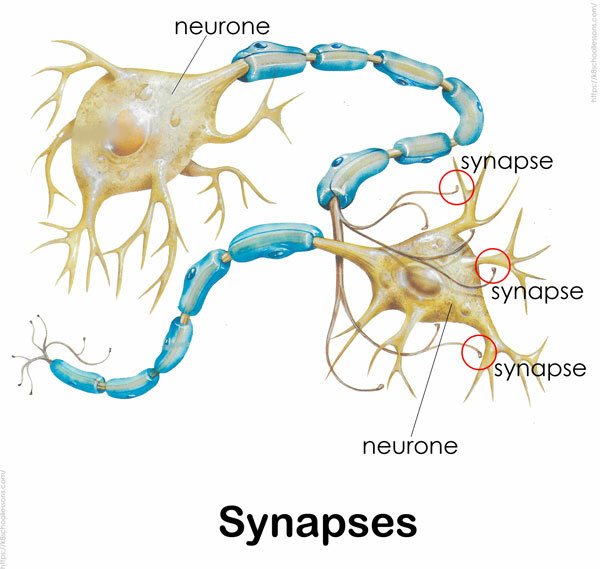 Synapses join nerve cells, called neurons to each other, just like plugs and sockets join up electrical wires. Therefore messages can spread fast to different areas of the body. The central nervous system is made up of the brain and the spinal cord. This is the main control centre of your body. 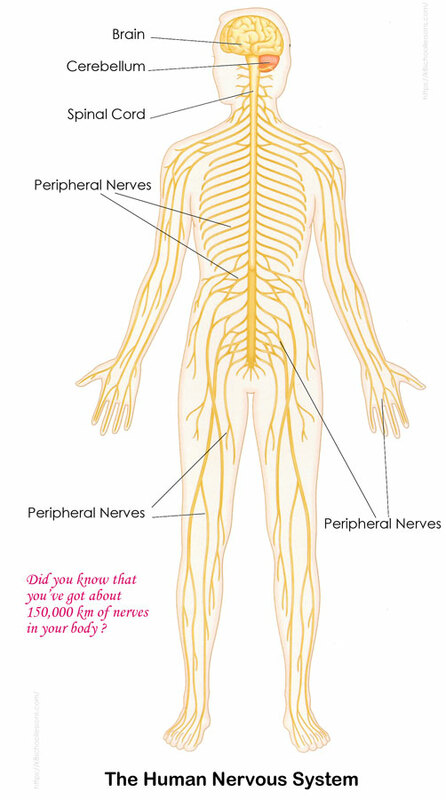 The Peripheral Nervous System consists of all the nerves that carry messages to and from the central nervous system to other parts of the body. 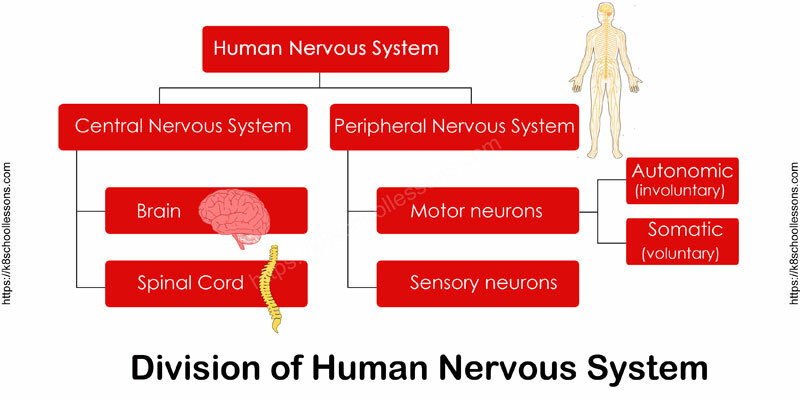 The Autonomic Nervous System has parts in both CNS and PNS. 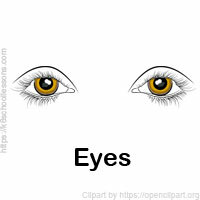 It deals with involuntary actions or autonomic (automatic) body processes, such as breathing, digestion, heartbeat etc. The somatic nervous system is the part of the peripheral nervous system, which controls voluntary movements of body. 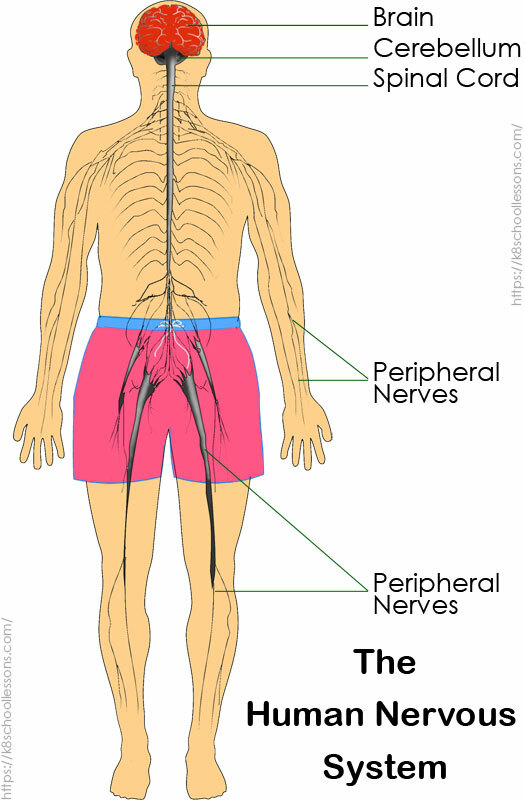 The nervous system consists of the following parts. The brain is a grayish-pink organ, which is located inside the head, protected by the skull. It is the main control unit of the nervous system. 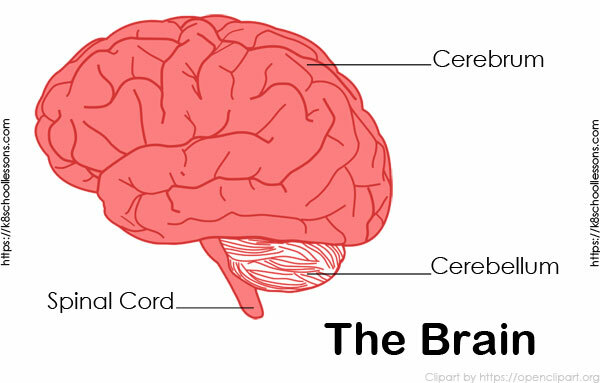 Click here to read more about the human brain. What is spinal cord made of? 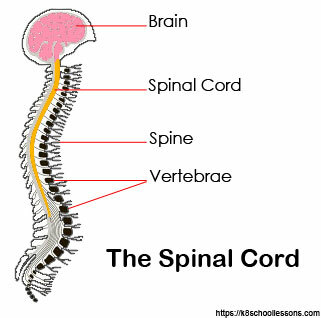 The spinal cord is made up of bundles of nerves that connect the brain to other parts of the body. It runs down from the brain through a canal in the centre of the doughnut-shaped bones of the spine (backbone). These bones which surround and protect the spinal cord are called vertebrae. Your brain and your spinal cord together act as the control centre of your body and make up the central nervous system. Nerves are made up of bundles of neurons (also called nerve cells). These neurons lie next to one another and link up to form the network of nerves, that carry messages to and from the central nervous system to other parts of the body. What are neurons (nerve cells)? Your neurons or nerve cells are very thin. Also, they can be very long, in fact some of your nerve cells stretch all the way from your big toe to your spine. Neurons carry electrical signals back and forth between the brain and the rest of the body. What are the types of neurons? There are three main types of neurons. The nerve cells or neurons that carry signals toward the brain from the eyes, ears, nose, tongue and skin, are called sensory neurons. The nerve cells or neurons that carry signals away from the brain to the muscles, are called motor neurons. The neurons, which are found in the brain and spinal cord and allow sensory and motor neurons to communicate are called relay neurons. Relay neurons are located between sensory input and motor output response. A neuron can be either a sensory neuron or a motor neuron, but not both. 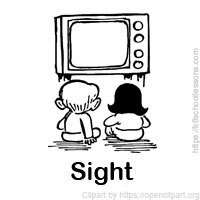 This means it either carries a signal toward the brain or away from it. The place where the end of a neuron (or a nerve cell) connects with another neuron is called a synapse. This is the place where two neurons meet. Neurons do not actually touch each other at synapses. A synapse just allows a coordinated response to a stimulus. Need to know how all these things work together in your body? Human nervous system for kids lesson is now ready to show you this. Your nervous system works very quickly. So, you can react fast to internal or external stimuli around you. 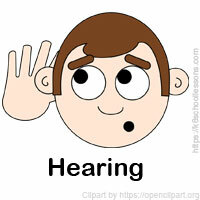 What is a stimulus (plural: stimuli)? A stimulus is any change in your environment that causes you to react. When you feel cold you move into the sun or wear a jacket. Signals of your body travel down a nerve at a speed of 350 kilometres per hour. This is faster than a sports car can drive. 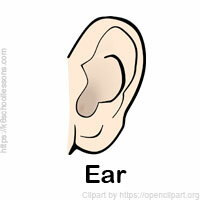 There are specialised groups of cells in each of your sense organ, which are the ear, eye, nose, tongue and the skin. These specialised groups of cells can detect changes or stimuli in the environment. 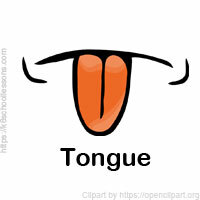 Each organ has receptors sensitive to particular kinds of stimulus. Temperature, touch, pressure, pain etc. Next, let’s learn about the types of responses in our body with this lesson, Human Nervous System for kids. There are two main types of responses performed by your body. A voluntary action is any action that you choose to do with your involvement through thinking. You cannot do these actions automatically without thinking. You have to think and volunteer to carry out these actions. This is why they are called voluntary actions or thinking actions. Walking, talking, reading, writing, drawing, driving, cooking, swimming, kicking a ball, scratching an itch and many more things you do in your daily life fall under voluntary actions. How does a voluntary action take place? When you need to walk, your brain tells your leg muscles to move, resulting walking. When you are hungry, your stomach telling your brain that it’s empty and you must eat. When you get an irritating itchy feeling, your body reacts by making you scratch. 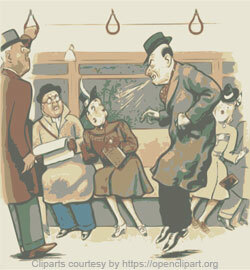 When you need to urinate, your body responses to the message that your bladder is full. If you want to ride a bicycle, your brain send signals all along the nerves to the muscles of the legs, telling the muscles how to move your legs to padel or move the bicycle forward, or to stop. A surfer’s brain interprets messages from sensory neurons and sends messages via motor neurons to move muscles to balance the body. 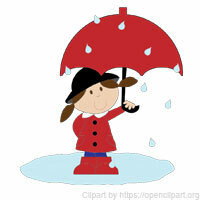 Similarly, the brain is also receiving signals from the senses and the rest of the body, telling it what is going on in the world around it, so that you can take an umbrella with you if it’s raining. What are complex voluntary actions? It took you quite a while to learn to ride a bicycle when you were small, but you do not need to think in order to carry out the action ‘riding a bicycle’ now. Moving your leg muscles to pedal the bicycle and move it forward, and also adjusting the other leg to do so, are all automatic now as you got used to them. Walking, tying a shoelace are also similar activities that take a lot of concentration to begin with. After enough practice you make the right movements automatically to perform such activities. These types of voluntary actions are called complex voluntary actions. Now we know what voluntary or thinking actions are, and how your brain is involved in a voluntary action. But did you know, that there are some essential actions take place in your body without you thinking? These are autonomic or automatic body processes and we call them involuntary actions. The actions take place in your body without you thinking about them or choosing to do them are called involuntary actions. The autonomic nervous system (ANS) helps to carry out these actions. Do you have to think to do these actions everyday? No, not at all. They happen automatically, without you thinking about them. But, these are also the regulatory functions of the brain, because it helps your body to regulate (automatically controls and maintain) itself. Breathing carries on even when you are asleep, without you thinking. This shows how automatic breathing is. Yawning is an involuntary action. 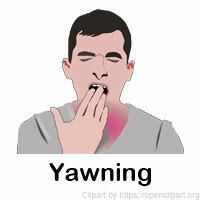 Once you have started to yawn, it is almost impossible to stop it. Blinking happens without you needing to think about it. Now, Human Nervous System for Kids lesson is going to answer a couple of questions that you may be eager to know. Why do you breathe more quickly and your heart beats more rapidly after a strenuous exercise session? After you exercise strenuously, your working muscles need more oxygen supply. Your brain makes you breathe more quickly and your heart beats more rapidly to increase the amount of oxygen supplied to your working muscles. 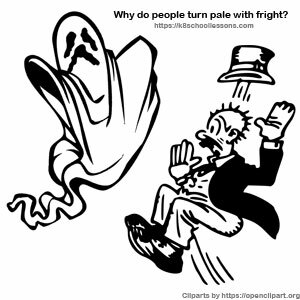 Why do people turn pale with fright? When you are frightened by something, the blood vessels in the surface of your skin automatically constrict (become smaller) so that less blood flows to your skin. This is an involuntary action that takes place when you are frightened to protect you. More blood is needed internally to help fuel your muscles for action in response to the situation. This is why you feel your heartbeat and the blood is pumping in your body when you get frightened. If you hand touches a hot pot, you will pull your hand away immediately, even before having no chance to think about it. 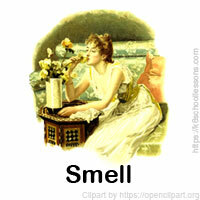 This is also a type of involuntary action, which is called a reflex action. 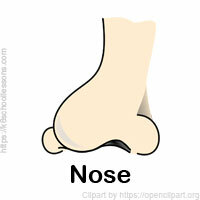 Coughing and sneezing are some other examples for reflex actions as they automatically take place when harmful substances get into the nose and lungs. Click here to read and learn more about reflexes or reflex actions. 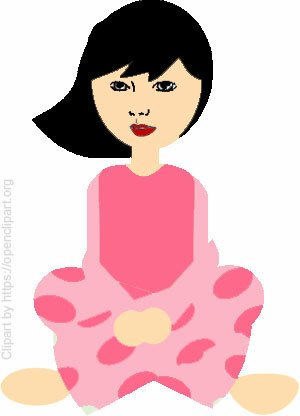 Do you remember the time that you got tingling feeling in your legs after sitting cross-legged for a long time? This is because, sitting cross-legged for a long time squashes the nerves in your legs. When you stand up, the nerves start to work again, producing a tingling feeling. What do the painkillers do? Before you get a filling at the dental, the dentist gives you an anaesthetic. This is a painkiller that stops nerves passing on pain messages for a short time. A good night’s sleep makes your body and brain slow down. But they don’t stop working. You need to sleep, so that the brain can sort out the events of the previous day. Hope you’ve learned a great deal of information with this lesson, Human Nervous System for kids.